Iron-deficiency is a common cause of anaemia (low red blood cell or haemoglobin levels). Deficiency of iron results from insufficient dietary intake and absorption of iron, and/or iron loss from bleeding which can originate from a range of sources such as the intestinal, uterine or urinary tract. 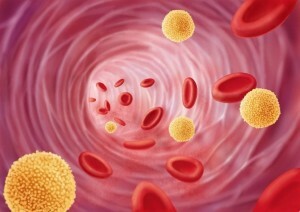 Bleeding causes loss of red blood cells more quickly than they can be replaced. Anaemia is one result of advanced-stage iron deficiency. When the body has sufficient iron to meet its needs (functional iron), the remainder is stored for later use in all cells, but mostly in the bone marrow, liver, and spleen. These stores are called ferritin complexes and are part of the human (and other animals) iron metabolism systems. Iron from the food you eat is absorbed into the body by the cells that line the gastrointestinal tract; the body only absorbs a small fraction of the iron you ingest. The iron is then released into the blood stream, where a protein called transferrin attaches to it and delivers the iron to the liver. Iron is stored in the liver as ferritin and released as needed to make new red blood cells in the bone marrow. When red blood cells are no longer able to function (after about 120 days in circulation), they are re-absorbed by the spleen. The body can also recycle iron from these old cells. Iron is very important in maintaining many body functions, including the production of haemoglobin, the molecule in your blood that carries oxygen. Iron is also necessary to maintain healthy cells, skin, hair, and nails. If you have fewer red blood cells than is normal, your organs and tissues will not get as much iron. Many people with iron deficiency anaemia will only have a few signs or symptoms. The severity of these symptoms largely depends on how quickly your anaemia develops. You may only notice few symptoms or they may develop gradually if your anaemia is caused by a long-term problem, such as a stomach ulcer. Children who drink more than 500mL to 700mL a day of cow’s milk (cow’s milk not only contains little iron, but it can also decrease absorption of iron and irritate the intestinal lining causing chronic blood loss). Non-steroidal anti-inflammatory drugs (NSAIDs) can cause bleeding in the stomach.Ibuprofen and aspirin are two commonly prescribed NSAIDs. If your GP thinks your medication is causing gastrointestinal bleeding, they can prescribe a less harmful medicine. Do not stop taking a medicine you have been prescribed unless your GP advises you to. Stomach ulcers. The acid in your stomach (which helps your body to digest food) can sometimes eat into your stomach lining. When this happens, the acid forms an ulcer (an open sore). This is also known as astomach ulcer (or a peptic ulcer). Stomach ulcers can cause your stomach lining to bleed, which leads to anaemia. Gastrointestinal cancer. In a few cases, gastrointestinal bleeding can be caused by cancer, usually of the stomach or colon. When diagnosing the cause of anaemia, your GP will check for possible signs of cancer. If your GP suspects cancer, you will be referred to a Gastroenterologist (a specialist in treating digestive conditions) for a more thorough examination. This means that if cancer is found, it can be treated as quickly as possible. Read more about bowel cancer. Gastrointestinal bleeding can also be caused by a condition called angiodysplasia. This is due to abnormal blood vessels in the gastrointestinal tract, which can cause bleeding. Chronic kidney disease. Many people with chronic kidney disease develop iron deficiency anaemia. Most people with chronic kidney disease who have iron deficiency anaemia will be given iron supplement injections, although daily tablets may be tried first. If you develop signs and symptoms that suggest iron deficiency anaemia, see your doctor. Iron deficiency anaemia isn’t something to self-diagnose or treat. So see your doctor for a diagnosis rather than taking iron supplements on your own. Overloading the body with iron can be dangerous because excess iron accumulation can damage your liver and cause other complications. Iron-deficiency and anaemia are diagnosed by a simple blood test. It is best to discuss with your doctor about your symptoms, and ask if your doctor would recommend a specific blood test that is widely available. The results in general will become available within a short few days. Make sure you see your doctor for the results after having blood tests. Even if the cause of the iron deficiency can be identified and treated, it is still usually necessary to take medicinal iron (more iron than a multivitamin can provide) until the deficiency is corrected and the body’s iron stores are replenished. In some cases, if the cause cannot be identified or corrected, the patient may have to receive supplemental iron on an ongoing basis. Since the approval of a new iron formulation called FerInject to be covered by Medicare in eligible patients, more and more people have chosen to have iron given intravenously. Unlike previous formulations that must be diluted and given slowly over 6-7 hours, the new preparation FerInject can be given over 15 minutes. There is no sedation involved and you can drive back to work after the infusion. The advantages of an iron infusion include the immediate boost in iron stores and the avoidance of common side effect of oral iron (constipation). Liquid iron can be expensive if taken for extended period of time (often months). How is Iron Infusion given? After being admitted by nursing staff and baseline observations have been taken (blood pressure, heart rate, temperature, respiratory rate and oxygen saturation), a doctor will insert a cannula into a small vein in the arm or back of the hand. Your nurse will then connect a medication line to the cannula containing 20mL of Iron solution (corresponding to 1g of Iron). The infusion will commence once you are comfortable and take approximately 15 minutes. Once the infusion is complete, the medication line will be flushed with saline, disconnected, and removed just prior to discharge. Repeat observations will be taken on completion of the infusion and you will be discharged shortly after, when deemed safe by your nurse. Possible side effects. A major consideration is to ensure that the person who inserts the intravenous cannula is a very experienced at it. At our Day Surgery facilities, all the cannulations are inserted by the Specialists or Anaesthetists, as this drastically reduces the risk of iron leaking from the vein to the surrounding tissue, which can leave a dark stain on your skin for a number of months. Other side effects are mild, and occur in 1 to 10% of patients, but tell your doctor immediately if you experience any of the following signs: rash (eg.hives), itching, wheezing and /or swelling of the lips, tongue, throat or body. What is the cost of the Iron Infusion. The cost of an Iron Infusion is $250 (please check with our staff to ensure this fee is still correct at the time of making a booking). This covers the cost of the medicine, admission to one of our hospitals to receive the infusion, the doctor’s fees and all associated fees. If you have private health insurance, you may be able to obtain a full rebate depending on the level of your cover. For more information on the rebate or to make an appointment please contact one of our centres, and one of our friendly receptionists will be able to assist you: Rosebud Endoscopy . Contact one of our friendly receptionists on (Rosebud Endoscopy) for further information. You can also make an appointment to see one of our Gastroenterologists to discuss further if you wish. You can also download and print the Iron Infusion Referral Form and to take to your family doctor to maximise rebates from your Health Funds / Medicare.